Farmers Market Bridal Shower luncheon - backyard feast! I am so very proud of this party. Kelley and I threw a bridal luncheon for our bestie Joanie with all our industry pals in attendance. The theme came to us after looking at some fall-inspired invitations on Paperless Post. Joanie is an amazing cook and the consummate host, so a Farmers Market Feast felt very natural to us. The luncheon was hosted it in Kelley’s backyard, with a slew of amazing vendor partners. We were so lucky to have a beautiful October day. 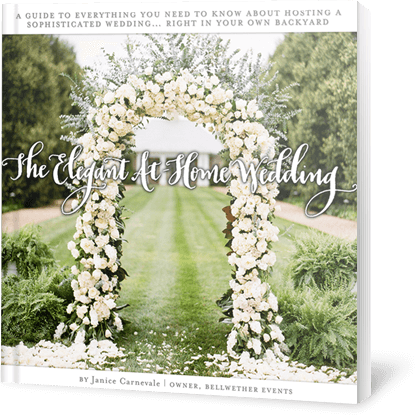 If you are wondering how two wedding planners throw a party for their industry pals, this post is for you. I’m going to take you behind the scenes and include as many tips and tricks as I can think of, to help you with your next celebration! Kelley and I started to craft the design with the linen. The swatch we had in hand was small, and we knew it was a little bit of a risk, but we both had a gut feeling that it would be amazing. And it was. It worked perfectly with my new favorite chairs and these vintage amber goblets and, well, everything! True confession: I hate using candles during the day time. I truly don’t believe in it (ask my clients, they will tell you.) I was very torn about using them for the luncheon, but in the end, it was the right call, because the tablescape benefitted from the added touch. This pallet menu sign. It went from being the bane of my existence to a piece I am super proud of. Kelley had the brilliant idea to use a pallet for the menu. But we went round and round on how to get the words onto it. In the end (meaning, with less than 48 hours to go,) I painted it myself. It took hours, and I was hunched over, sitting on the ground, and super uncomfortable the whole time. But it was so worth it!! And Ashley added some greenery to the top, which turned out perfectly. While scouring farmers markets, Kelley found this amazing purple and yellow cauliflower. Since it fit with our palette so well, we had to buy them, though they were priceier than expected! I’m happy with how we featured them, in crates flanking the menu board. Later, a friend took the cauliflower home and used them in her dinners that week! I regularly bring ideas to Michele at Meant To Be Calligraphy that might be a bit crazy. Writing on various purple vegetables has to be among my nuttiest. But I was thrilled with how it all turned out. And Kelley and I were also pumped at how many purple vegetables we were able to find! Having 3 styles of eggplants certainly helped, but how about that radicchio and the bell peppers? Pro tip: I should have peeled off a few of the radicchio leaves before Michele wrote the name. I was also pretty darn stoked to be using the black matte flatware, as well as this sweet trio of charger/base/salad plates. We wanted to serve a 2 course family-style meal, but we knew we wouldn’t have anyone helping us and wanted to make the transition from first to second course as easy as possible. Layering all 3 plates from the start made it super easy for us to collect the salad plate in one trip and then bring out the entree platters right afterwards. During my many trips to farmers markets for inspiration, I regularly noticed kettle corn for sale. At the last minute we added these small baskets of kettle corn to the table. Since we started with a salad course, this was a nice extra snack to tide guests over until the main course came out! I can only imagine how annoying it must be to work with two planners on one event. And true to form, Kelley and I did our best to give Atelier Ashley Flowers as much conflicting info as possible 🙂 In the end, we were able to all agree on some inspo photos and a color palette (we did, after all, have the linen and the invitation) and Ashley absolutely crushed it. I was near tears with how perfect the flowers were. We did an online invitation. 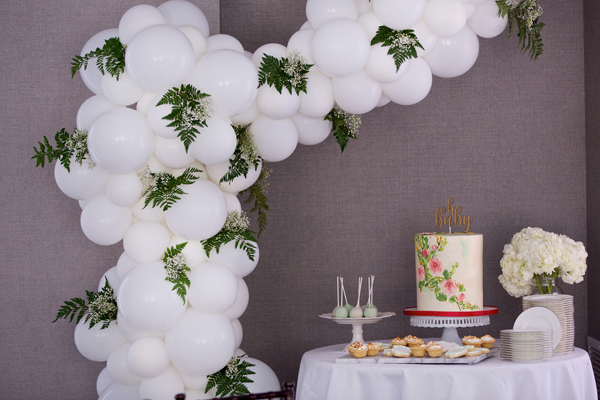 We didn’t want to wait on paper invitations and we wanted to save the budget for other items. But at the time of the luncheon, Paperless Post would allow you to order paper versions. Here you can see the invitation, styled to perfection by the incredible Lisa Blume, with a touch of whimsical calligraphy by Meant To Be. We landed on pies for dessert. I honestly don’t remember how we got there, but Buttercream Bakeshop made some amazing petite pies for us all to enjoy after the family style lunch. Kelley and dipped into our personal collections for the pie plates. And can we also talk about this killer arrangement from Atelier Ashley Flowers? It is like nothing I’ve ever seen before. We kept the drinks really, really simple. The bar offered red wine, white wine, and bubbly, plus bottled waters. Kelley and I rented 2 kinds of glasses and bought this copper drink bucket from Home Goods. Paperzest made this Cheers to Joanie sign for us. This table usually lives in Kelley’s living room. This was another spot where we opted to keep the budget under control. My favorite feature of this Farmers Market Feast were the party favors. In the weeks leading up to the luncheon, Kelley and I visited a number of local farmers markets for inspiration. I was immediately struck by bread for sale by Great Harvest. I knew right away I wanted to have a bread table at the celebration. After talking it over with Kelley, it made sense to make the bread the party favor. The morning of the luncheon I went to three different bakeries to get a variety that I was satisfied with. Crates from Something Vintage and signs from Paperzest round out the look. And let me tell you, this was a hugely popular idea. I highly recommend carbs as favors for your future parties. Check back later this week – I am writing a detailed post on the bread table. That’s about it! What do you think? Do you have any questions that I can answer to help you with your next backyard feast? Let me know!